Advanced GC-MS Blog Journal: Sample Identification – Which is a Better Method and Instrument, GC-MS with its Library Search or LC-HR-MS with the Provision of Elemental Formula? A common method of sample identification involves the use of GC-MS with its electron ionization mass spectra and automated library search and identification software. However, a growing portion of sample compounds is not amenable for GC-MS analysis thus the use of LC-MS, particularly with high resolution time of flight MS is growing. The identification method used with such LC-HR-MS instruments is based on the provision of elemental formula. Consequently, interesting questions with practical implications are which of the above identification methods and instruments is better and whether LC-HR-MS can fully replace GC-MS or the later has intrinsic value that LC-HR-MS does not provide. In this post we discuss these questions and try to provide answers. Clearly EI mass spectra are far more informative than Electrospray mass spectra as the fragment peaks of the former provide important structural information. In addition, library based identification (such as by the NIST library) can be automated and unlike with the LC-HR-MS method it provides the sample compound name and structure. Most importantly, based on the EI fragmentation pattern the library often provides the proper sample identification at the isomer level which can not be obtained with elemental formula alone. 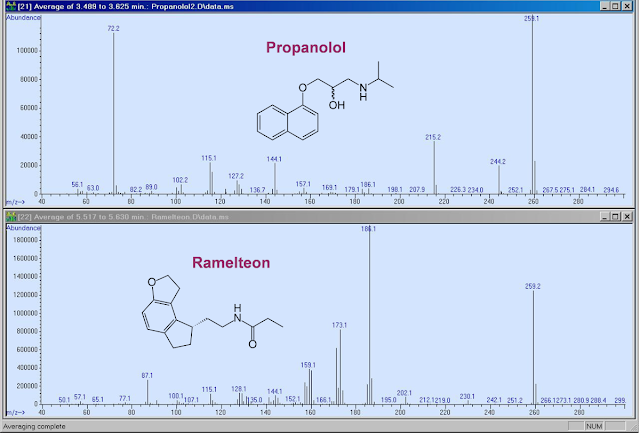 In Figure 1 below we show the Cold EI mass spectra of two drugs, Ramelteon and Propanolol, which have the same elemental formula of C16H21NO2. Cold EI is achieved by electron ionization of vibrationally cold molecules in a supersonic molecular beam, obtained with the Aviv Analytical model 5975-SMB GC-MS. As clearly shown in figure 1, the mass spectra of these two drugs are very different due to their highly different structure. 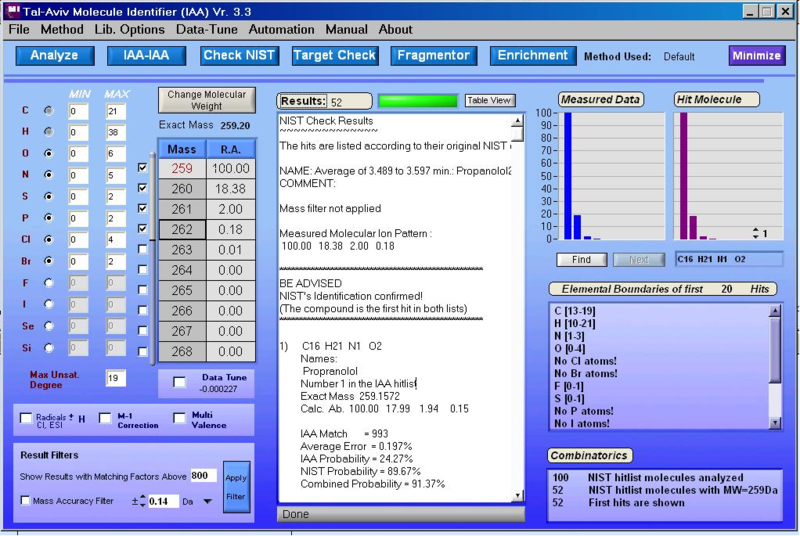 NIST identification of Propanolol as an example was very easy with ~90% identification probability, thereby demonstrating the ability of NIST library to identify a sample compound at its isomer level. We note that a search of the NIST 2005 library of C16H21NO2 reveals that it has 21 different compounds with this elemental formula, thus showing the magnitude of the isomer problem in attempts to identify a given sample based solely on its elemental formula. e) Will automatically confirm or reject NIST library identification according to its generated elemental formula. In short, the best method and instrument should be a one that combines library identification and the provision of elemental formula for broad range of compounds. Figure 1. 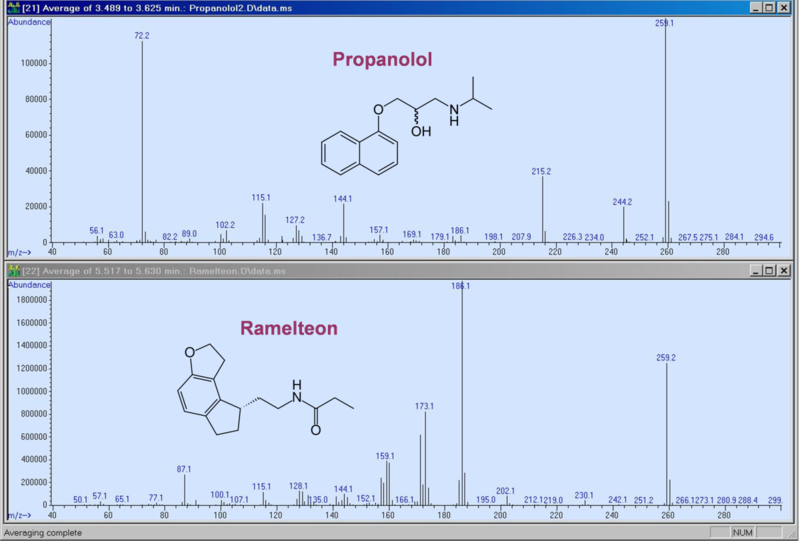 Cold EI mass spectra and structures of Propanolol (upper trace) and Ramelteon (bottom trace). Note that while these two drug compounds have identical elemental formulas of C16H21NO2, they have very different structure and EI mass spectra. Figure 2. 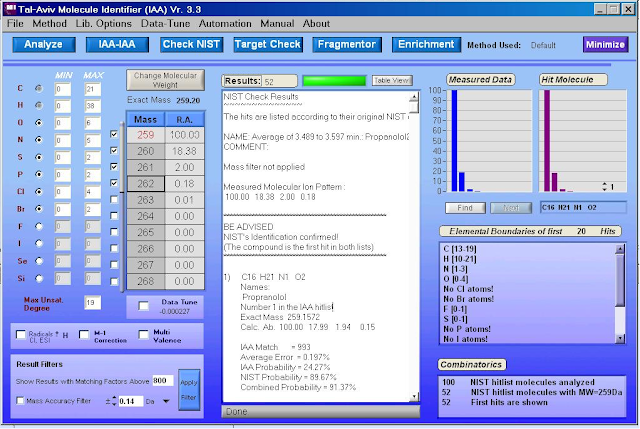 Tal-Aviv Molecule Identifier analysis (based on isotope abundance analysis) of Propanolol for the provision of its elemental formula and for the confirmation of its NIST library identification. This combination of sample identification via two independent methods of NIST library and IAA is probably the best way for sample identification.